I have never had a strong affinity to brown. Which baffles my mind since brown looks less harsh against my blond hair, blue eyes, medium color skin. It is not that I am a huge lover of black, but I really just float around in the color world. But I need a new brown bag. One of my last brown bags was my Fendi Spy (yes 2.5 years ago), in honey, which is a perfect shade. 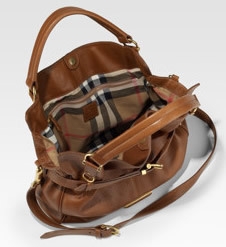 And now I have found my new brown bag obsession, and am quite surprised that it is a Burberry Bag. Burberry is synonmous with its check pattern, which many tire of quickly. I like it here and there, loved my Burberry scarf, but I can only handle it in doses. When Burberry creates a stunning leather bag and leaves the check pattern to the interior lining, they can end up with a fabulous handbag. And this is precisely what has happened with the Burberry Belted Leather Tote. The pebbled calfskin looks soft in pictures, which typically means that it is indeed sumptuous. 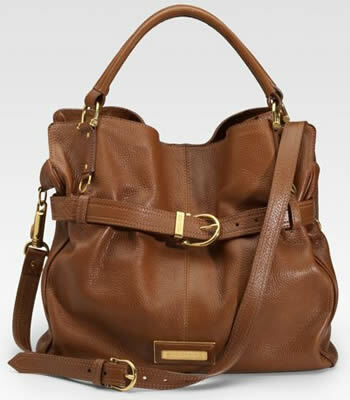 What I love about this bag is the casual look, the belted accent which gives such a nonchalant finish. No need for crazy amounts of hardware, like in the Burberry Warrior, just simple with a nice touch. This look has me feeling fall already, it will be perfect with hues of green, purple, and brown. The golden hardware is a much better option than silver, giving a refined feeling, which I always feel in fall. Don’t you see that? The long coats and boots dress people up in the fall, making an effortlessly chic ensemble. There is also a detachable shoulder strap, double top handles, and many pockets on the inside. I simply can not argue with this handbag. Buy through Saks for $1195. 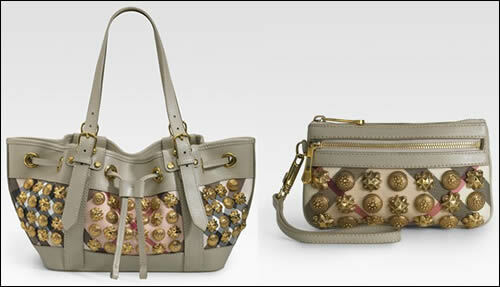 Burberry handbags may be actively trying to get away from their signature nova check image, well, sort of. While the preppy nova check pattern is recognizable from miles away, the brand has been striving to bring something new to the table, and attempting to revamp the brand and give the younger, hipper crowd something to swoon over. 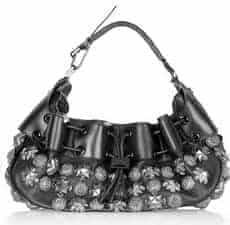 That is precisely what the Burberry Warrior Bag was supposed to do, but it ended up causing a ruckus with a struggle between love and hate. People either absolutely loved the edgy and funky style or absolutely abhorred it all. To be honest, I loved the bag, but refused to buy it at the price. So I am Warrior-less.